This blog has muddled itself into obscurity over the last year; this I know. It’s finally time to recap the last months and hurdle full-steam back into ColdPhoto: no longer a year in the north, but many years in the north. 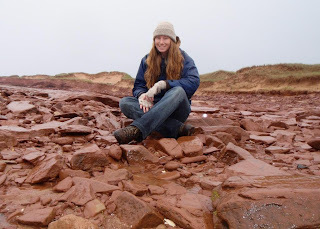 Despite the fact that I wasn’t keen to blog about my life in the geology world (no insult to geology but rather to my odd internal categorization of “things to blog about”), I had quite a number of interesting adventures (geology and non-geology) over the last year. In the fall I visited friends in Hawaii and Indiana, and over winter break I got to spend a frigid weekend in the Joshua Tree desert with some old friends from Longyearbyen. Early spring found me skiing for the first time in Bloomington, Utah (see the last post), and mid-March I shipped myself to Boulder, Colorado, for an intense week-long training certification in Arctic survival. The course included wilderness first aid, bear safety, basic survival skills, and most interestingly aviation crash safety and rescue. This aviation training deserves special mention as I breeze through the rest of these trips. After discussing the theory behind putting a helicopter into auto-rotation, learning crash positions, and being shown countless nightmarish photos of Arctic crash sites (fun, I know), we went outside and took turns strapping into a mock-helicopter and timing how long it took us to escape. This included not merely unbuckling and stepping out the door, but breaking through windows, grabbing survival gear (first aid kit, inflatable boat, etc), and finally – most valuably – doing everything blindfolded, and then doing everything blindfolded in snowmobile gloves (huge things that give you zero dexterity with any sort of strap or buckle). The most important message from this exercise was the importance of memorizing your surroundings – even little things like “in which direction does my seatbelt unstrap” cost time and energy in the mild panic of our testing. The course, titled “Learn to Return”, also offers a longer version of the aviation safety which includes being strapped in a helicopter cage and dropped upside down…underwater. Excellent training but I’m rather glad I didn’t have to do that part. Our helicopter training, however, took special significance for us with the grim news of a crash in Antarctica, which killed two German polar scientists in March. The next major event in my life was another surgery on my accursed foot. After having quite a bit of pain, I was disturbed by a new sort of crunching in my foot and went to an orthopedic surgeon to check out my Norwegian bolt. As it turned out, the multiple holes drilled in my foot resulted in the bolt slowly getting jarred loose – it was still in the bone, but sort of bouncing around. So, in April, I went back into surgery to have it removed. I was able to stay awake for most of the procedure, but was put to sleep after they found they had to remove more bone growth than expected. After a irritating 2 weeks on crutches (only two weeks this time, and it still managed to drive me out of my mind), I discovered that although the bone was going to be fine, the surgery had cut a nerve line and I can no longer feel the right side of my foot. Luckily I can still move all my toes, which was the major concern, and now a couple months later I find myself with a gnarly scar and not much sensation at the surgery site, but essentially able to run freely. And yes…of course I kept the bolt. What’s next…this brings us close to the end of the school year. I went on many excellent geology field trips this year, but none so epic as the week-long department field trip to Zion National Park in Utah. The trip occurred immediately before I was to end my stint as the geology technician, so despite going a little out of my mind with the stresses of moving and orchestrating the survival of 12 geology students in the desert, it really was a spectacular trip. 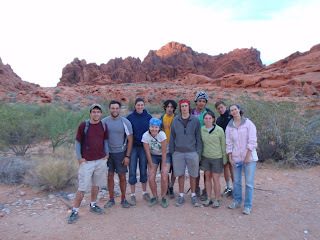 In all, we visited Snow Canyon, Zion, and the Valley of Fire, with no casualties. Success! The day after we got back, I jumped on a plane and flew to Halifax in eastern Canada for a much-needed vacation. 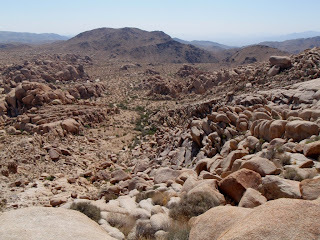 Being the geology technician this last year was immensely educational, but I found living in the outskirts of LA uninspiring, and was more than eager to get back to the sorts of adventures I became accustomed to during my Watson. In Halifax I stayed with my friend Lisa, who I had worked with on the Canadian Coast Guard. 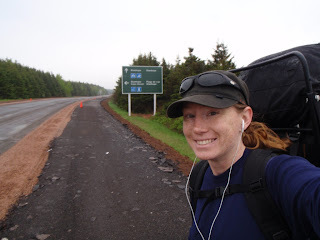 While I primarily enjoyed sleeping and taking walks to the lake with her dog, the most exciting part of the trip was when I drove out to Prince Edward Island and backpacked across the northern coast solo for 4 days. The weather on my first day out was gorgeous. 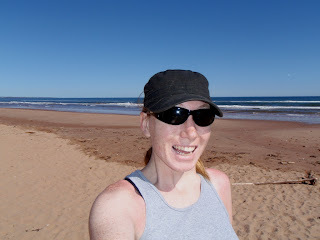 That day, I and my 50lb (20kg) pack went the 12km from the point of Robinson Island to Stanhope Beach. This nearly killed me (I blame my out-of-shape bad-foot leg), and upon reaching the campsite in Stanhope, I found that the campsite was closed, and that there was no water, and that there was an abundance of mosquitoes. Then it began to rain, and I discovered I had forgotten a can opener, making dinner somewhat useless. Being too tired to hike back out to my car, I spent a fitful night in the campground, only to wake up at 4:30am (worried about getting caught) to pack out, in the rain. Eventually I was picked up along the road by a nice old lady who must have thought I looked as beaten as I felt by that point. 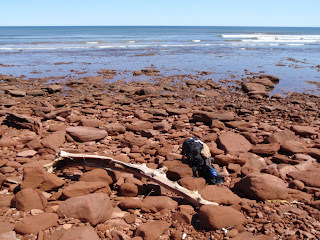 This gave me the energy to continue on to Cavendish, where I spent the rest of the day hiking sans pack. I left Canada thoroughly rejuvenated. Most recently I spent a couple days hiking through Joshua Tree, this time earning myself some mild heat stroke with my friends Zach and Cameron. 120F (49C) weather is one very good reason I look forward to colder climates. The auk research team this year consists of Nina Karnovsky (the Pomona professor leading the project), me (fancy title: Field Director), and Derek and Julia, two undergraduates at Pomona. Right off, I encourage you to check out www.project.pomona.edu/arctic which is our research blog – it’ll include posts from everyone on the team. I don’t want these two sites to duplicate each other, so here’s the deal: the photos on ColdPhoto are exclusively mine, and can’t be found at the Pomona site. On the other hand, some of the photos and stories on the Pomona site will be taken by me, but not duplicated at ColdPhoto. ColdPhoto also, being my personal site, will revolve around Me and not the little auks. 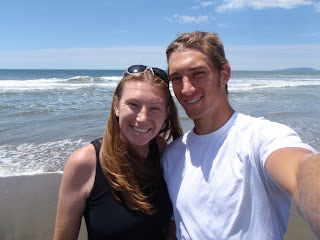 We left California early Wednesday morning – picked up in a stretch limo, nonetheless. Ridiculous. We flew from LAX to Newark, then directly to Oslo, and finally on to Tromso – remarkably smoothly, and discovering all of our luggage in the Tromso airport. In Tromso we were greeted by Daniel, an old friend of mine from Longyearbyen, and Jorg, a collaborator on our dovekie work. The last time I was in Tromso, I was on crutches, flying to Drammen to suffer out the end of my foot recovery before flying to Siberia – and the last time I had explored the city was the day before my first surgery in April 2007. Being back a year later, able to walk properly – well, it is something I have been waiting for for over a year. We had dinner with Joachim, Lene, Pierre, and Johanna, more friends from Longyearbyen that you may remember being featured on ColdPhoto. On Friday the team explored Tromso before loading our gear on the RV Lance and heading into the north. Our first stop was at Byornya – Bear Island – where we dropped off a small Polish team, including one woman I had met in 2005. We have seen quite a few whales, and tons of birds, and just now we have passed our first ice flow. Derek and Julia are beyond excited and absolutely everything on the ship is bringing me back to my days on the CCGS Amundsen. Tonight we will reach the Polish station – I remember the last time I saw it 3 years ago, driving out on a zodiac to the ship that would take us to Longyearbyen. That was the moment I knew I was in love with the Arctic, and coming back to that place is like going home. SWEET STALKING MONKEY! Apparently there are still, on average, at least 30 of you visiting this site every day. And I know you're not just my parents, because the technology says you come from 6 different continents! Who do I know in Columbia? Or, let's see, SUDAN? Ok so its been awhile since I've written. Let's move on. Since I last wrote I have taken time off from my geological duties to visit Indiana, Hawaii, and most recently Utah. If you can't go international, go national! 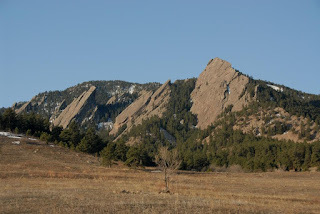 In a couple weeks I'm going to Colorado to learn how to survive helicopter crashes (yes, seriously). While in Utah, I tried my hand (feet) at skiing for the first time. Crazy, I know! Of course I mean cross-country skiing, because the idea of strapping sticks to my feet is crazy enough without then throwing myself off a mountain. As for relevant updates: adventures are in the works! I'm not completely at liberty to discuss things yet, but for those of you desperately clicking the refresh button, waiting for something exciting, you will be rewarded in, say, about 3 months. Until then, I continue doing the geology gig, trying not to go out of my mind while surviving suburbia, and spending all my money on airplane tickets. Maybe I'll write something about the Colorado thing. Look for that mid-March. Oh yah...shameless self-promotion: here. And here.